Come deep into the forests of Scandinavia as four masked characters and a musician bring to life the folklore of trolls. It's Grandpa Trollson's 200th birthday party, but he refuses to come out of his tree stump to celebrate! With the help of some audience participants onstage, Grandpa cannot resist the power of storytelling. Join us for three truly interactive tales based on stories by Hans Christian Andersen, featuring live music, incredible masks, physical comedy, improvisation, and good old-fashioned troll trouble! 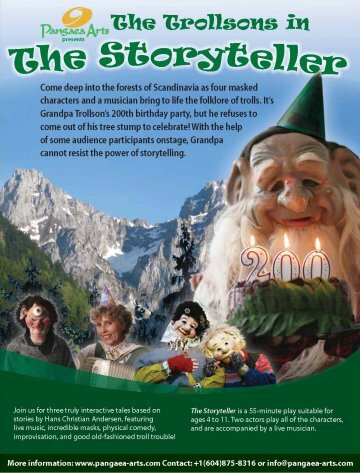 The Storyteller is a 50-minute play suitable for ages 4 to 11. Two actors play all of the characters, and are accompanied by a live musician. The Trollsons are a family of masked Scandinavian trolls, that have been performing together since 1995, and have been seen at festivals, special events, theatres and Children’s Festivals throughout the world. They have a wide range of performances, including children’s theatre, festival-stage shows, and interactive roving characters. 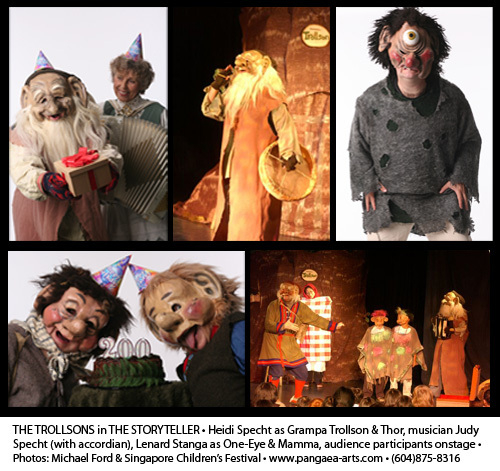 They had a very successful run of “The Storyteller” at the 2009 Singapore International Children’s Festival, which has also been seen at the London, Ontario Children’s Festival, Shanghai Children’s Festival, and the China Puppet Theatre in Beijing. The incredible troll masks were made by award winning mask designer Melody Anderson. THE STORYTELLER is touring to BC schools and communities in 2009 and 2010. To book THE STORYTELLER in BC, please contact ArtStarts in Schools at (604)878-7144; toll-free: 1(888)878-7144. A unique show that engages and enthralls. The cleverness of their staging, the artistic flair and their inimitable talent make performing for young audiences seem easy and effortless. 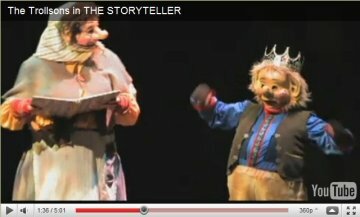 The Storyteller was presented as part of our Children’s Theatre Series. Their show delighted and engaged our audience and the masks were a true visual treat. I would highly recommend their production to anyone presenting children’s theatre and look forward to seeing them on our season offerings in the future. The students thoroughly enjoyed your production, especially the volunteering and interactive segments. It was a great idea “volunteering” a male staff member for the Princess Pea part! Thank you for a wonderful and very enjoyable performance! Sandra Chan, Ranch Park Elementary, Coquitlam. Thank you for bringing your delightful show to our town. We really appreciate you sharing your gifts with us. Recently seen at the Vernon and District Performing Arts Centre Kid's Series (October 2009), the Penticton Children's Showcase, and the Kamloops Young People’s Concert Series at the Sagebrush Theatre in Kamloops (January 2010), as well as schools throughout BC.